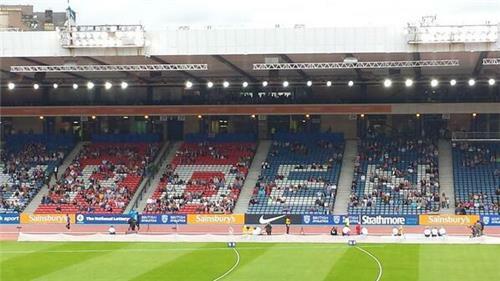 July 11-12, 2014, Sainsbury Anniversary Games, Glasgow, Scotland. Watch Mo Farah, and many others run, jump and throw over two days in the eighth stop on the Diamond League circuit in 2014. The women's pole vault is at 4.40m at the moment, Kyriakopoulou, Hutson, Stefanidi and Silva all get first time clearances. A minute of applause for David Littlewood at #ESAAChamps with chairman Sue Garvey paying tribute to the ESAA secretary who died in March. Suhr hasn't entered the competition yet, but all other ten pole vaulters are over 4.40m so the bar moves up to 4.55m. Stopped raining, too. That was a B 100m. The athletes in the A race are going to have to run well to better that! Dafne Schippers just smashed the Dutch 100m record leaving Bartoletta and Gardner behind her in 11.03! Remember, she's a heptathlete!! Over in the PV,Katerina Stefanidi is the only athlete clear at 4.55 with their first attempt, although @JennSuhr is still to enter. 17-year-old Wang Jianan of China leads the men's LJ after two rounds with 7.86m.